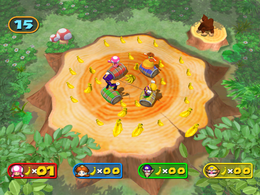 Stump Change is a 4-player Donkey Kong minigame in the game Mario Party 7. Its name is a pun on the phrase "chump change", meaning a very small amount of money. Donkey Kong rolls on a barrel and gets a banana. When he reaches the end of the stump, he jumps on a smaller stump and eats the banana. The players, barrels and bananas will then fall from the top of the screen. In the minigame, the players have to roll their barrels through the many Bananas located on top of a giant tree stump. There is a Banana Bunch located in the middle of the stage, and is worth more Bananas. If the players fall off the stump, they are out. After the minigame, the Bananas are exchanged for Coins. Rules – "Hop on the barrel and roll over the bananas to collect them." Advice – "If you fall off the stump, your game will end. Stay up there!" This page was last edited on November 25, 2017, at 18:45.